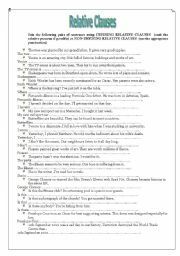 A simple exercise to make students review ADJECTIVES ENDING IN -FUL AND -LESS. 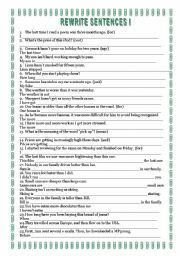 A lot of practice for students to learn the difference between Defining and Non-defining relative clauses. 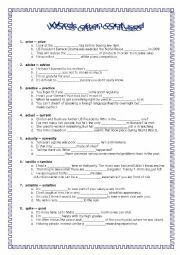 REWRITING EXERCISE FIRST PART:50 sentences for students to review several grammatical contents from comparative to conditionals, etc. Just a simple exercise to help students to tell the difference between these adjectives. 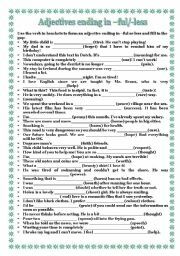 You can find some exercises to practise the difference between pairs of words often confused. The pairs included are, for example, lie-lay, rise-raise,rob-steal, realise-release,actual-current, and so on. The key is included. 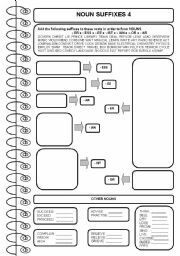 THIS IS THE LAST OF FOUR WORKSHEETS RELATED TO WORD FORMATION. 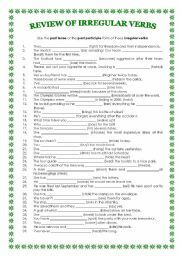 IT INCLUDES THE FOLLOWING SUFFIXES TO FORM NOUNS:-AR -ER,-OR,-EE,-ESS,-IAN,-IST AND OTHER NOUNS. I HAVE UPDATED IT RECENTLY. 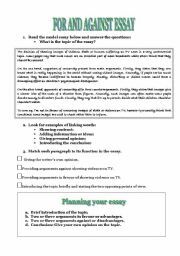 This worksheet has a model essay with questions so that students can get acquainted with the main aspects to plan a for and against essay. Besides, I have added several topics to write an essay. 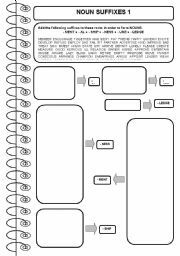 THIS IS THE FIRST OF FOUR WORKSHEETS RELATED TO WORD FORMATION. 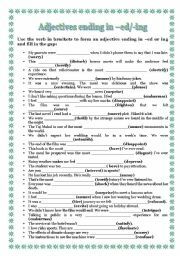 IT INCLUDES THE FOLLOWING SUFFIXES TO FORM NOUNS: -MENT,-AL,-SHIP,-NESS,-URE,-LEDGE.